When retweeting isn’t enough, there’s always money. Usually the only jolts I receive on Twitter are the result of a little light cyberstalking of an ex-so-and-so (He owns a llama farm?!?) 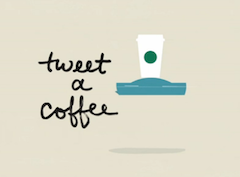 but Starbucks is seeking to change that with a new “tweet-a-coffee” promotion. The idea being that sending a pick-me-up by way of a $5 eGift card will make all of your friends love you and every caffeinated dream come true. Or something. Should you know someone’s Twitter handle and feel the need to send them $5 worth of Starbucks products, the new program requires you to link your Twitter account to a Starbucks account, which in turn must have a credit card on file in order to gift that moolah. Anyone with a protected Twitter account must disable that feature to either send or receive the eGifts as well. But what if you want to send @[HereIsWhereYouPutACelebrityName] more than $5? You’ll just have to tweet him/her repeatedly because the eGifts only come in the amount of $5. Once the object of your caffeinated desire has received the link to the eGift card, he can either print out the proof or bring a mobile phone with the confirmation to a Starbucks store to redeem it. It’s unclear, even when reading the Terms and Conditions for the tweet-a-coffee program, whether or not the recipient must also have a Twitter account linked to a Starbucks account, but the sender should know that once you accept those TOS, you’re giving Starbucks permission to tweet on your account. What it all boils down to —you’re basically trading a coffee for social media advertising. But then again, coffee is important. Your call.